We have hand picked each item in the Lake Country HDO Pad Kit 5.5" because they are highly effective when paired together. To create the best kit possible we utilize our years of detailing experience, combined with input from some of the best detailers around the country. We are confident you will get outstanding results with each item and really enjoy how your vehicle looks afterward. Save $11.96 off of the retail price of individually purchasing these items! Lake Country HDO Red Waxing Pad (5.5") - the softest of the LC HD Pads, allows you to apply waxes, sealants and all-in-one (AIO) products! Lake Country HDO Orange Polishing Pad (5.5") - the most versatile LC HDO Pad, remove imperfections while finishing down great! 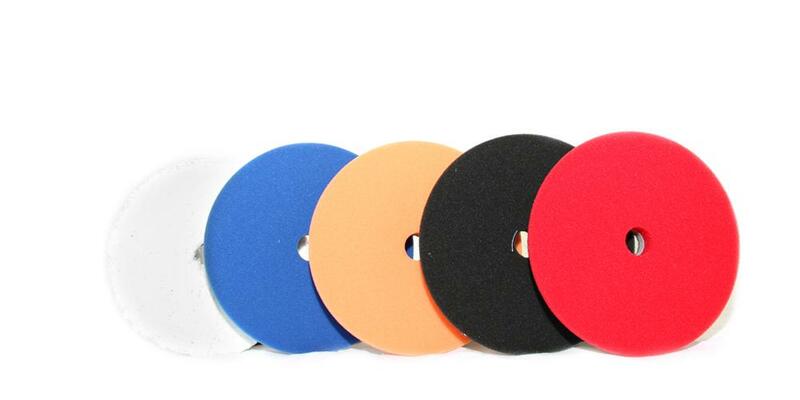 Lake Country HDO Heavy Cutting Fiber Pad (5.5") - microfiber pad designed to remove heavy imperfections with ease! Lake Country HDO Blue Cutting Pad (5.5") - the most aggressive LC HD Pad, designed to remove heavy scratches, swirls, and defects. Lake Country HDO Black Finishing Pad (5.5") - leaves behind an incredible level of clarity with a flawless finish! Every time I use an HDO pad I am absolutely amazed at how they stay so cool. Very durable and great performance. One might even say they are game changers. Love these pads with the Rupes Mark 15. I highly recommend these pads for cutting and polishing. Produces amazing results. Read all customer reviews of Lake Country HDO Pad Kit 5.5"